FAQ01 - How do I change my username? FAQ02 - How do I change my username symbol? FAQ03 - How do I change my avatar? FAQ04 - How do I change my profile information? FAQ05 - How do I change my signature? FAQ06 - How do I add widgets? FAQ07 - How do I remove widgets? FAQ08 - How do I change the order of my widgets? FAQ09 - How do I edit widgets? FAQ10 - How do I add a custom background? FAQ11 - How do I repeat my custom background? FAQ12 - How do I add custom CSS to my profile? FAQ13 - How do I change the font colour? FAQ16 - How do I create a text link? FAQ17 - How do I create an image link? FAQ19 - How do I link to another deviantART user? FAQ20 - How do I embed media? FAQ21 - How do I find a page URL? FAQ22 - How do I install a journal skin? FAQ23 - How do I change my journal skin? 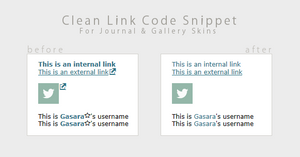 FAQ24 - How do I edit my journal skin? FAQ25 - How do I add a gallery skin? FAQ26 - How do I add a description? FAQ27 - How do I remove a description? FAQ28 - How do I change my folder icons? FAQ29 - How do I hide my folder titles? FAQ30 - How do I turn stacks on? FAQ31 - How do unwatch Scraps folders? This has been four long days in the making. This FAQ covers the questions I get asked most frequently about customising deviantART accounts. It includes thirty-one entries (which provide both information about the topic and a how-to guide) and links to other material you might find relevant. Since I started making journal skins, resources and helping out with dA profiles I've been inundated with questions about how to do certain things as well as requests for help when things go wrong. As you know, I'm always more than happy to help out but sometimes it can get a little overwhelming and, of course, if I'm away your questions can go unanswered for a while. With that in mind I decided to create this FAQ and collection of articles that you guys can refer to whenever you need help. I've tried to cover everything I think you'll need but if there's anything else you would like to see here then please just let me know. Of course, you're also all still welcome to come to me for any help you might need. I don't want you to think you can't do that anymore! If you can't find your answer here then please don't hesitate to send a note or a comment. Hello Gasara! in "USING IMAGES - FAQ14"
when I use this method, the picture is too big. is there any way I can make it small? Hello Gasara I was wondering if you could help me out with something? I'm new at prettying up my profile and I can not correctly code my images. As you can see the images line up vertical but I would like them to be horizontal to each other. Do you know anyway to fix this? I would really appreciate your help, thank you! Hiya. I've only got access to my phone right now so can't check the code to see what the problem is. I'd first suggest removing any spaces/line breaks between the two image codes to see if that helps as they should line up otherwise. I'll take a proper look when I get chance though. I reworked them with no spaces in between but they still seem to line up vertical. I'm not sure why exactly it won't work. Does the image width and height have to be specific, or does that really matter? Thank you for helping me out! I've been able to take a look at your code this morning and can confirm the issue is because of the size of the images. Widgets have a maximum width of 386px for content so you have to make your images with that in mind. While larger images can be resized to fit, the ones you are using have a lot of transparent pixels around the edge which still take up space on the page. I've trimmed the images down and resized the width to 180px each so they now sit nicely next to each other. I've added a few extra spaces and breaks to the code to give a nice bit of padding but you can expand or reduce this as you like. Here's the links to the resized images if you want to use these. Hope that helps. If you need anything else just let me know. Yay!!! It's working, you're a lifesaver! Thank you so much you've been a really great help! If I run into something else I'll make sure to note you. You're welcome. It was no trouble at all. Hiya! The FAQ you've commented on has been designed to explain most of the things you can do. If you have a read through you find out how to add backgrounds, images, links, custom css and the like. At the bottom you'll find (amongst other things) a basic HTML guide which explains the basics of font formatting and alignment. There's far to much information for me to relay personally but if you take a look at these guides and search for other tutorials on deviantART then you should be able to pick up a lot of tips. As with anything it's all fairly simple once you study and practice a bit. Am i able to center the text? On your profile page? Sure, just use the code below. Replace sample text with your own content. I have a picture I want to Div Align left. How do I do this? do you know a way to change a picture in your page and make it smaller ?? Do any of you know how to decrease the size of a journal and still keep it centered? what if a stamp goes UNDER the custom box background and is not visible? what is wrong? Agree with the comment above - this is a lifersaver! Thank you Gasara!! So I'm trying to learn how to do custom background. When I go to use this an image with the html on my newest deviations and favorites widgets. The deviation basically become invisible/not there. Is there a way to fix that or do I need to use a custom widget and put in thumbnails? I looked a bit online, but maybe I'm being oblivious to something, because I couldn't find the answer. Hey, I need some help to manage my group! Who I have to contact? I have a group and due to my lack of time I made somebody else founder, now the girl is missing since 2014 and I can't become founder again! What to do ????? I think it would be best to search the official FAQ for that which deals will all aspects of the site. If you can't find your answer there you should contact the help desk. Dividers are just images so check out the image/thumb FAQ sections. Awesome Thanks for all this great Info. But I am having difficulty putting up something on my page: when I put in a background in the custom widget, the try putting an image (not within a content box) in front, nothing comes up, just the bg, not the image. I have looked at the troubleshooting for this problem, and you said to "close off" the image with a div tag, and put it vefore the code for the bg, and I've tried both, but nothing. Is there something I'm not putting in the HTML code? Some of them are in the DeviantArt FAQ. if you change your email address, is an email sent to the old one? i genuinely thank you for taking your time making this!!! Do you have issues having your page layout look the same on all three browsers? Thank you! This really helps! About time someone posts this! Thanks. oh myyy this helps a lot! thanks! CSS is a style language used to define the style and formatting of web pages. It is used in conjunction with HTML. If we think of HTML as the building blocks of the web then, essentially, CSS is the painter and decorator. Very simply, HTML defines the structure of the page and CSS defines the style. What I'll be helping you with here is getting to grips with the basics of CSS. I'll be explaining how use CSS as well as providing a number of examples that you can use to style your own web pages and journals. All you need to do is copy/paste the code and replace the sample text with your own content. Along with the quick reference I've also written a brief glossary of terms and provided a list of useful links in case you wish to do some further reading. HTML is a markup language used to create web pages. It primarily consists of content placed between named tags that define the layout or style of that content. Is it just me or does trying to explain HTML and what it does always seem to make it sound more complicated than it actually is? Very simply, HTML is the building blocks of the web. With it you can create a web page right from the foundations of the layout to the finishing touches of style. Don't get me wrong, it is a fairly involved topic but it really is quite simple to pick up the basics. What I'll be helping you with here is the formatting aspect of HTML. These are the things that add colour to your page and make your font fancy. Quite a few people still seem to have issues with getting their custom box backgrounds to work correctly so I thought I'd put this little troubleshooting guide and FAQ together to help. If you follow the instructions closely, you shouldn't have any problems. If you encounter any issues that aren't explained here, please let me know. I will update this guide with any extra info or solutions as they are requested. You can read more about customising your profile page here. Express your personality through colors, stamps, gifs, etc. While many widgets are restricted or locked for non-premium members, there are still a variety of great widgets that you can add to your profile, even without a membership. Learn the basics of Gallery CSS with this easy-to-follow guide! 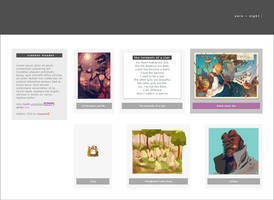 Step 1: Click on one of your Gallery or Favorites folders in the sidebar. Step 2: Click the button called "Folder Options" or "Collection Options." CustomBox+Journal Tips n Tricks-Updated 25-Sep-14More updates comings soon! !